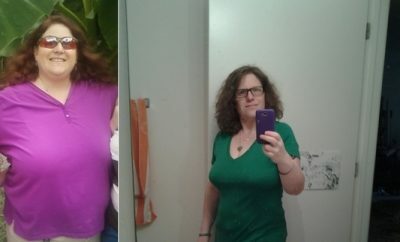 How I Gained It: I gained my extra weight by overeating, making bad food choices, bingeing on comfort foods and not being active. I was stuck in a cycle of self destruction that I did not know how to break: the more I ate, the worse I felt about myself, which would in turn cause me to eat more. My health issues became amplified with each of my pregnancies, as I just made my weight problem worse with every sugary treat. I had no one to blame for my actions but myself. Growing up, the people in my life would try every fad diet and weight-loss plan there was. The diets would work for a while but the extra weight would eventually come back. I honestly believed it was impossible to reach a healthy weight and maintain it. Breaking Point: My breaking point happened when I realized I had two tiny sets of loving eyes watching me slowly self-destruct. 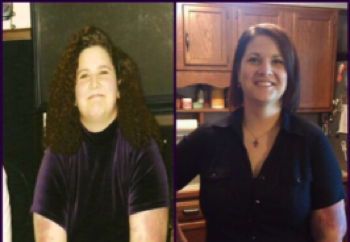 I was only in my early 30s, but I was suffering from a host of weight-related health issues. I felt completely out of control. I knew I had to do something but didn’t know what. Many people said I couldn’t do it, I wouldn’t do it, I couldn’t stick with it, etc. They believed I would fail because I wasn’t strong enough. They were wrong because once I found the courage within myself to act, I became unstoppable. How I Lost It: My children were my main motivation; I wanted to teach them that goals are attainable with hard work, commitment and effort. I also needed them to know that being healthy and strong is more important then being skinny. But before I could do this, I had to first change myself. To do this, I changed my relationship with food and my attitude about exercise. I realized I had to stop making excuses. I put my plan into action by hitting the local library to get informed on healthy ways to lose weight. I disregarded all the healthy eating plans that wanted me to buy their products — instead, I started eating clean. That meant cutting out the processed food and opting instead for fresh fruit, vegetables, lean meats and whole grains. My approach to eating can be summed up this way: The more natural the better, especially when it comes to feeding my family. Our bodies were meant to eat fresh fruits and colorful vegetables, not artificial food dyes, preservatives or processed sugars. Although I had weight loss in mind when I began, it was important to me to make changes gradually and involve my family. The children helped me plan meals, shop for groceries and prepare healthy meals. I tried to make healthy eating fun so the whole family would want to stick with the changes. Portion control was also key. I personally eat five small meals a day to avoid being hungry. I keep only healthy foods in our home to avoid temptation. But getting healthy is about more than what you eat, it’s about moving your body too. When I started my journey I was very out of shape and couldn’t do much, but I didn’t let that stop me. One cold March morning I bundled up my little ones, put them in a stroller and went for my first one mile walk. That was the first of hundreds of walks that would lead to a healthier me. Eventually, I started leaving the kids with my husband in the evenings so I could jog or run. Once I found the courage and confidence to move and started seeing my self get stronger, I knew it was time for my first gym membership. I looked at gyms for a few months and found a perfect fit — A small gym with a family-like atmosphere was just what I needed. Plus they offer child care. These days, I train five days a week and I really love challenging myself. I keep track of all my workouts to help keep me motivated because I can look back and reflect on how far I have come. I also keep my exercise routine fresh to prevent boredom — I’m always trying new exercises, machines, equipment and fitness classes. Some people see fitness as work but I see it as a time for self discovery, a time to reconnected with my body and a time to clear my mind. I’m not the only one who’s reaped the benefits of this new lifestyle — My husband, who was unsupportive at first, has lost 40 pounds himself and is now a big source of support for me. There’s no way around it — getting healthy takes work, commitment and effort, but believe me, it’s all worth it. I am stronger, faster, healthier today then I have ever been and I have no intention of ever going back to my old habits. I don’t know everything about healthy living but I am constantly learning and growing. I am a work in progress and hope to be for a long time to come. 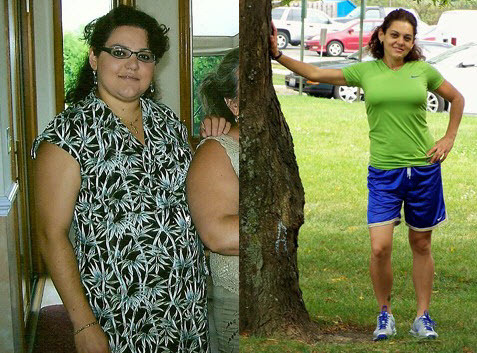 Anna has maintained her weight loss for over two years now.